This fall, we had the opportunity to do an engagement photo session with very close friends of ours. Tim has been a loyal friend of Chad's for many years and he's honored to be one of his Groomsmen in September. "When I first got to know Tim in 5th grade, I thought he'd be a good friend to have because he was known as 'Bone Crusher'. He wrestled an eighth grader and broke his leg! To this day, we all still call him 'Bone'," Chad explains. "When I found out that he had proposed to Lindsay, I was extremely excited for them!" 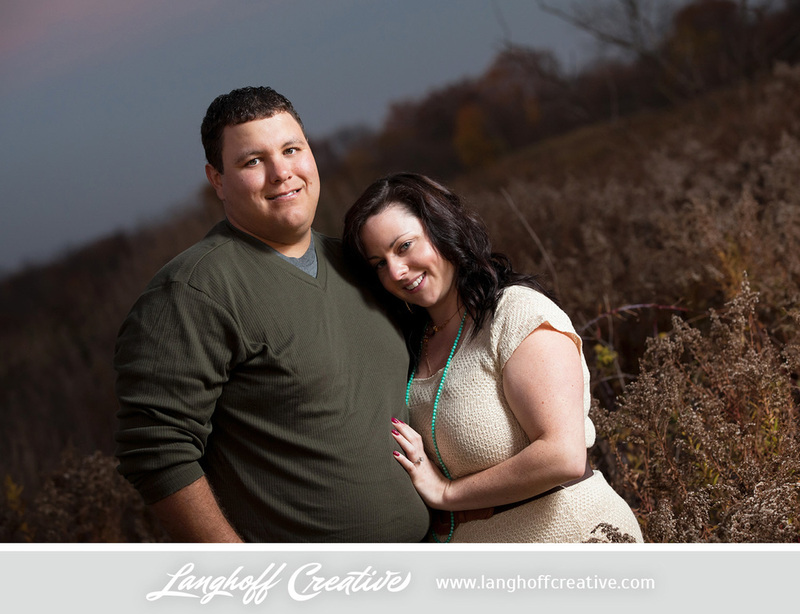 We have LOVED getting to know Lindsay over the last six years that they've been together. They are such a fun couple! Tim and Lindsay were introduced at their friend Allen's house in February of 2007. Allen was friends with Tim in high school and with Lindsay in college. It was sort of a set-up—when Tim got there, everyone arranged themselves so that the only place for him to sit was next to Lindsay. They had a good time talking all night and getting to know each other. "I knew right away that there was something special about Tim, but he was so shy that I wasn't sure how he felt about me," Lindsay said. "There was one point early in our relationship where Tim was so busy with work that I didn't hear from him for over a week and I thought it was all over, but he soon proved me very wrong." Tim also knew there was something special about Lindsay right away. They had to work hard the first few years of their relationship because of long distances and busy schedules, especially when Lindsay moved even further away for 2 years of grad school. Tim could tell right away that she was fun-loving. "I thought Lindsay was very good looking and had a pretty cool personality," Tim said. Lindsay thought Tim was a sweet guy that had a goofy and funny streak. Lindsay says, "There's really no secret to our relationship. We just have enough fun with each other, love for each other, and respect for each other that it comes naturally. We don't have to really work at it!" Together, Tim & Lindsay love to play golf, ride Tim's motorcycle, play tennis, shoot hoops, watch movies, and anything outdoors that keeps them close to nature. "One of the sweetest moments of our relationship was when Tim cooked me dinner for the first time. He was taking care of his parents' house when they were out of town, so he invited me to stay the weekend with him." Lindsay remembers. "For dinner, he grilled steaks and made pasta and potatoes. It was our first chance as a couple to experience this 'domestic bliss'." After being around these two, it is obvious that they love to laugh together! Lindsay's favorite thing about Tim: His ability to keep me calm and level-headed (because I can tend to be a little over the top sometimes). He is always the voice of reason to me when I need it, and I am a better person because of it. He always knows just what I need to cheer me up, calm me down, or comfort me. Bonus quirk she loves: He makes up his own dance moves to his favorite TV show theme songs. Tim's favorite thing about Lindsay: She's fun-loving. She can always find fun in the things we do together. Bonus quirk he loves: She randomly bursts out her sweet dance moves. Tim asked Lindsay if she would be able to take time during the weekend to go hiking with him at nearby Starved Rock State Park. That Saturday, Lindsay was frustrated because she had to spend the first half of the day finishing up some things for work. She was not too excited about spending the afternoon hiking, but Tim convinced her to go. "We had a nice hike, and when we reached a bluff overlooking the Illinois River, Tim told me how much I meant to him. He then got down on his knee, took out a beautiful ring, and asked me if she would do him the honor of being is wife." Lindsay was pleasantly but totally surprised, gasped, started crying, and kept saying, "You have to be kidding me!" Eventually, she came to her senses and said "yes" of course, and Tim slipped the ring on her finger. They have planned their wedding for September 21, 2013 to be held at the historic Civil War-Era Century Memorial Chapel and Naper Settlement Living History Museum in downtown Naperville, IL. The reception will be held at the nearby Abbington Distinctive Banquets in Glen Ellyn, IL. For Lindsay, it has been a stressful but very fun and exciting time picking all of the sites, vendors, and details. Although Tim is consulted before any choices are made, he is very happy to just go with the flow. "We are going for a somewhat fancy affair with a 'rustic fairytale forrest' theme." How cool! Lindsay said, "I'm looking forward to having Tim as my best friend and partner to share in every moment for the rest of our lives together, knowing that I will always have my best friend by my side through thick and thin." Tim is just looking forward to having the woman that he loves with him for the rest of his life. They both are looking forward to starting a family with each other. "We love that there's a 'friendly rivalry' in our home when it comes to baseball." Lindsay is a lifelong Cubs fan, while Tim is a lifelong White Sox fan. "This is one area that we will never agree on. In the summer of 2011, I finally convinced Tim to go to a Cubs-White Sox game at Wrigley Field," Lindsay smiled. "Although we rooted against each other the whole game, we had a great time—and Tim especially loved that the Sox won. We hope to make this a tradition with our family in the future." Although fun, rivalry exists in their relationship, I love this sweet story of tenderness & care, too. On their second ski trip as a couple, Lindsay was finally getting the hang of it and after successfully skiing to the bottom a few times, she took a nasty fall. Tim stayed with her and sent somebody to get the ski patrol. Once the ski patrol got her to the bottom of the hill and examined her knee, they put her in a temporary splint and their day of skiing was cut short. Tim got Lindsay into the car, drove to the hotel, and carried her in. "He set me on a chair so that he could check in and when he went back to pick me up, I swung my arm around and accidentally elbowed him in the mouth, which ended up giving him a fat lip!" Despite her beating up on him, Tim still got Lindsay to the room and took care of her for the rest of the weekend, and even for the next couple of months when she was on crutches and in physical therapy. Lindsay laughed, "It was such a goofy and stupid accident, but it helped us to work on our teamwork, and it really made me realize how thankful I was to have Tim by my side." We asked Tim and Lindsay if they had any advice for other couples. They said, "Find the right balance between respecting your needs as an individual and respecting the needs of your significant other. You must do the things that are important to you, but all while putting your love for your significant other first. Also, just have fun with each other every day!"